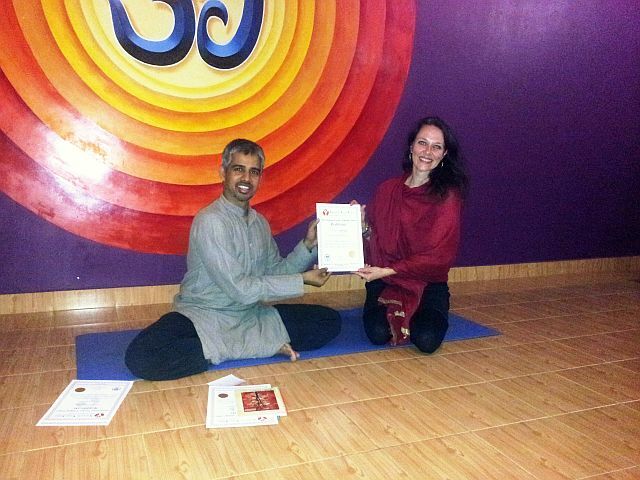 Natalie from Germany was looking for a yoga teacher training course in India and some time away to reflect and heal. Initially she was thinking of heading to the beaches of Goa but after asking the yoga.in team for advice, she decided to join Bharath Shetty’s teacher training course at IndeaYoga, Mysore. She shares what she experienced and gained from the 250-hour course. Here I am, Mother India! People say you either love India or hate it. I love it. When I decided to do this trip, everyone was worried. “Do you really want to travel to India, alone? It’s too dangerous for a woman! Have you heard the latest news?” Yes I did, and I was worried too. But as soon as I made the decision to take a break from everything, I knew I was on the right path, and it HAD to be India, the motherland of yoga. Yoga had been a part of my life for many years. It strengthened and grounded me, and every time my life got a little crazy, yoga took me right back to the mat – and my inner self, and I could smile again. But this time, I was at a point where my life was upside down, physically and mentally. I felt tired; exhausted from too much work and was still recovering from an unhealthy, painful relationship. So I knew I needed to go somewhere far away from home where I could find myself again, see other things, cultures, and try to close the circle of (love) pain and let go… a little bit like ‘Eat, Pray, Love’. Initially my idea was to spend a few weeks in Goa hanging out on the beach. I would find a nice yoga school, get a TTC (teacher training course) certificate, meet a lot of fancy yogis and enjoy life. I’m glad that yoga.in’s founder, Otto Stricker, advised me to focus more on ‘profound knowledge and spirituality’ than on ‘fun and sun with yoga’. So my choice ended up being a young yogi called Bharath Shetty who runs IndeaYoga in Gokulam, Mysore. And it turned out to be one of the best things I have ever done in my life. Mysore is a beautiful city, about 140 km away from Bangalore and easy to reach by train, bus or – if you want to make the trip more comfortable – by taxi. There is a flight connection between Bangalore and Mysore too. I liked Gokulam right away, with all its lovely cafés and restaurants, offering fantastic breakfasts and nice meals, and the street food I had with my classmates after our evening classes. 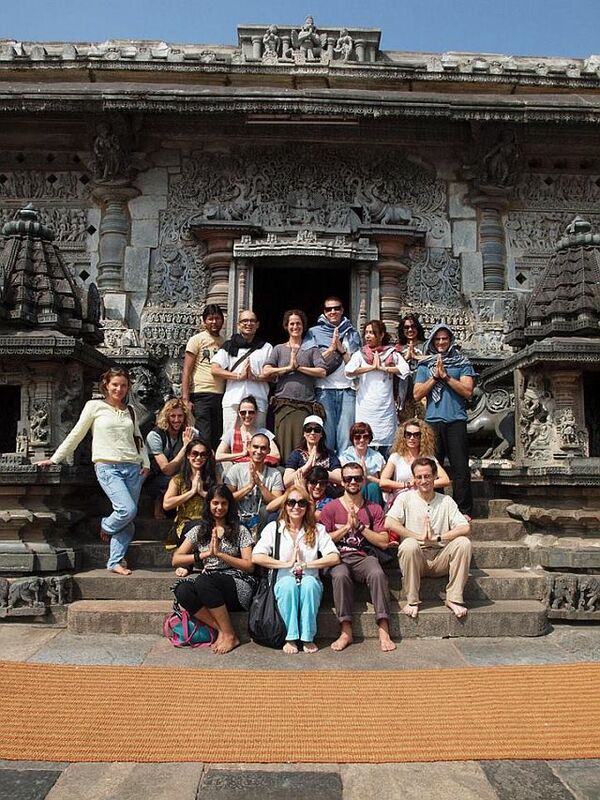 You meet so many yogis from all over the world, and also get to know a little about people and daily life in India. As IndeaYoga does not provide any accommodation or meals, you need to take care of this yourself. Renting an apartment is not a big deal in Mysore, but prices have increased in the past few years because of the growing yoga community, and you can get a crappy deal for a lot of money, so beware. So let’s talk about the teacher training. I remembered entering the shala the first time – and it hit me! I saw this big OM sign on the wall: its colours were ‘jumping’ at me and when I sat down on my mat I felt a strong energy on the floor. I looked around and saw the curious, excited but also shy faces of my classmates and I knew we were all in the same boat. It was the right place at the right time, time to change. And there he was, Bharath Shetty, a warm-hearted and experienced but strict teacher, with a great sense of humour and a deep knowledge about yoga, having graduated from three top yoga centres in India. Bharath offers a fantastic mix of classical yoga put into the context of our modern lives. He teaches hatha/vinyasa flow in a Mysore-style (self-lead practice) with a big focus on how to get into the asanas (yoga postures) in such a proper and precise way that you can really tell he studied under BKS Iyengar. The teacher training course itself is so well structured that by the end of it, you have, along with many other aspects, a thorough knowledge of philosophy, asana, physiology, meditation and pranayama (breath control) – and most of all: the confidence to teach! He and his team are so passionate about sending well-trained teachers out into the world because they believe in high standards – and this is what you get. By starting to teach small groups of 4-5 people from Day 2, you have no other choice but to ‘jump off the deep end’ – what better way to learn? 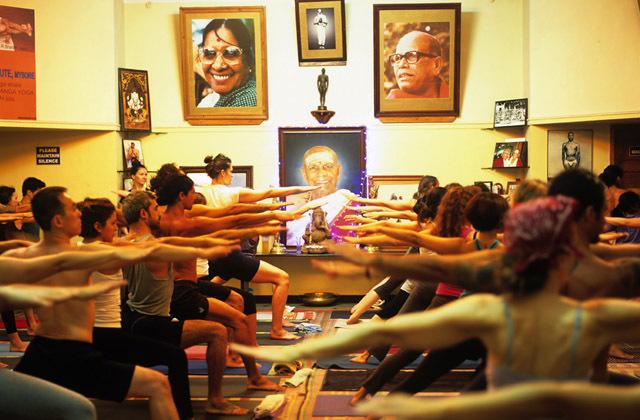 The 250-hour teacher training course is 6 days a week of hard work, from 5:30am to 8:00pm. We practiced yoga twice a day, learned more than 70 asanas, including their techniques and benefits, chanting, meditating, preparing the group class for the next day… We climbed into bed after the evening mantras and mediation, tired but happy that not an hour was wasted. Physically, it was the most challenging thing I have ever done. During the first week, I had pain everywhere! But as Bharath said at the beginning of our course, suddenly you start to feel ‘these beautiful changes’ – and sure enough, we felt them! He encouraged us to listen to our body, accept our physical limits and to “listen to our heartbeats”. I loved it when he said that in savasana… what a powerful phrase! It reminded me that when we feel lost, all we need to do is be still, draw the attention inside of us, and within this stillness listen to our inner voice and learn to trust ourselves because our heart very often knows the answers. The most valuable lesson I learned from Bharath was that becoming a yoga teacher means becoming a yogi first! It’s not only about showing asanas to other people, having a perfectly trained body, and doing this happy OM-thing together. It starts with your own daily practice, implementing meditation and yoga philosophy into your daily life, and bringing body, mind and breath together. This trinity is called ananda (bliss). You meet life with less fear and worries, and with more presence, grounding, humbleness, kindness and love… and for this you get the right tools from Bharath and his team. Overall, I had a fantastic time at IndeaYoga. I met wonderful people, especially my lovely classmates. For a good reason, yoga means union, and this is what we had, 18 different nations united. Moreover, I experienced a challenging, high-level teacher training which I can highly recommend, and I feel blessed to have met Bharath and his beautiful family, Neda, Rahsmi and Krishnan, who made this time so special to me. I started to love myself again, closed the circle and let go for the better…. For more information about teacher training programmes with Bharath Shetty, visit the IndeaYoga website. Jane lives and works in India and is part of the yoga.in team. She is trained in vinyasa, hatha, viniyoga and prana vashya yoga, having practised with many teachers and explored different techniques around the world. She is currently completing her 500-hour yoga teacher training as well as training in yoga therapy. Here she shares some tips for yoga teachers who are just starting out, or for those who are looking for inspiring ideas on how to thrive as a yoga teacher. How were you first introduced to yoga? I was 7 years old and very much impressed with the physical approach of gymnastics. A neighbour of ours took me to a teacher who showed me photos of yoga asanas (postures) and they convinced me that it was gymnastics. It took 2 years of me practicing asanas before I understood that it was not the gymnastics I had been looking for. He then introduced me to pranayama (breath control) and said that there is something beyond the physical aspect. It was then that I started experiencing and getting involved more in yoga. When did you realise you wanted to dedicate your life to practicing and teaching yoga? It was when I was 15 or 16. By that time I had a very strong practice of asanas and pranayama. Even though I started with the aim of achieving flexibility, I was drawn to pranayama practice which helped me to create my own sequence, which is now a system of practice. There was a voice in me which always kept me on this path. I was a student in electronics and psychology, but I always heard a voice saying this is not the path, you must practice yoga. I was 13 years old when I started to teach. My teacher opened a branch for me and introduced me to people of all ages, so all credit goes to him. I also worked as a coach to those participants who represent the state and country in competitions when I was 15. How did Prana Vashya come about? I wanted something beyond just a physical challenge to come through with my own practice. I felt that there was a need for another element to be included so I wanted to connect the breath with practice so that the influence remains for a longer time. This does not mean performing a lot of asanas but just synchronising these two elements to bring about a major change in the mind. It’s a sequence which will keep the person confident, energetic, healthy and highly energetic. That is what we mean by Prana Vashya, it is the controlling of the prana, which is life force. You talk about the breath being one of the main components. How is the breath different to other styles of yoga such as ashtanga vinyasa? Breath can be used in many ways in the practice. In Prana Vashya instead of physical accomplishment of a bandha (energy lock), we follow the breath lock which creates a point of focus within the body. So the main intention is to keep the practitioner focussed throughout the practice and provide him with easy elements to focus on. Each practitioner is asked to breathe and move in a particular way for every half breath, so there is constant attention fixed on the practice and no time for the mind to wander as it is completely engaged in itself. In our approach of abdominal breathing, we don’t just see the lungs as the part of the body which takes in breath because if the lungs receive the breath, it should be with the support of the ribcage sideways and the abdomen downwards, making space for the lungs to expand, which we explain is a complete breath. If we say breathe in from the abdomen first, we are very sure that the breath won’t reach the abdominal part first – it starts working from the chest and then comes down. We expand the abdomen and create space which would not open if the chest expands completely first. Also, when you move the abdomen continuously, it is not happening independently and has to be influenced by the spine. The lungs can move with the help of the subconscious, but the abdomen cannot do that all the time so there is a constant message from the brain and the spine is influenced by the abdomen moving which will keep you more activated in the spine, with more warmth and more circulation. You limit the number of people in your classes and teacher training. What are the reasons for this? We keep it to a maximum of 12 in regular classes and we limit the teachers’ training course to four, to ensure everyone is satisfied. This way I can provide my full attention and they get the maximum amount of knowledge. Can anybody practice Prana Vashya? Yes, definitely. Because we observe the practice not in terms of only physical accomplishment but also its effect on the body and the mind, we have variations for any stage of the practice – a beginners to advanced. There are variations within the same series, so even though the sequence is made up of 62 postures, we have 62 variations. Even though there are 12 people in the class, every practitioner will work according to his or her breath capacity, physical capacity and limitations. What type of student do you want to attract? We tend to seek practitioners who want to build a personal, consistent, regular practice, not those who want to relax. For these people, yoga in Mysore would not be a good option because we believe that yoga asana practice or pranayama is not for bliss now but for bliss later, so we always say the process should be hard and the effort should be blissful. If you could give one piece of advice to your students about their yoga journey what would it be? I would say don’t stop with asana and pranayama alone. Give yourself the time to analyse what is happening, because we believe that asana and pranayama are just the pedals of the bicycle but the bicycle is moving and for you to realise it you have to be in a meditative state. So I would suggest sitting for at least 20 to 30 minutes a day observing how the mind is changing, how consistent it is, and how strong it is. You conduct some yoga therapy, can you explain what this means to you? From a very young age I was curious to observe the individual muscles and ligaments of the body and try to observe their capacities. This has helped me work with various people according to their requirements. According to me, therapy means bringing something back to normal – so we try to observe what is missing, what is the cause of any ailments or problems, and we try to work from the source rather than with the symptom. Your back bending classes have become quite popular with people from different schools attending. What do you think makes it unique? There are a few reasons for this. People call it ‘back bending class’ because they learn a few advanced postures but this course is actually called ‘back bending and overall flexibility development’ where we have not limited it to just back bending but also work on strengthening. I think something that makes it unique is we try to sequence the practice every day so there will not be a common sequence which the person follows. By observing their energy and capacity in the way they perform the sun salutation, we will tailor their sequence every day and try to break down a few postures which we fix as a goal to be accomplished by the end of the course. For more information on Prana Vashya Yoga, visit their website. Images courtesy of Prana Vashya Yoga. Mysore is known by most as the capital of ashtanga yoga but for me it is where I discovered Prana Vashya Yoga, a new and unique style of yoga developed by a modest but increasingly well known teacher named Vinay Kumar. Sometimes in life there are certain suggestions (call it fate if you will) that we can’t ignore. A few years ago I was practising in Rishikesh where I met a women who over a cup of tea told me of a little-known teacher in Mysore who was making quite a name for himself. Like me, she discovered Vinay by word of mouth. “A very special man and a very special teacher,” is how she described him. Over the years, her words often popped into my head and one day I decided it was time to act and packed my bags for Mysore. 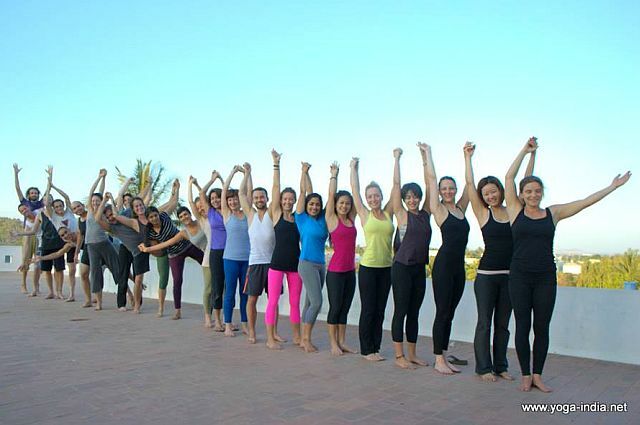 I signed up straight away for the 2-month teacher training course with Vinay and it turned out to be one of the most rewarding and challenging training programmes I have done (this was my 4th). Prana (life-force) Vashya (control) yoga follows the breath, and through breath regulation in asana, it works at channelling energy into a more useful form. Vinay states that this yoga helps the practitioner to recognise his or her own physical and psychological capacities and to develop them in a positive way. Through Prana Vashya practice, my understanding of myself and my relationship to my practice changed and developed immensely. Vinay has a presence which is felt immediately. His inner conviction is evident and his complete dedication to the practice and to his students is faultless. He only takes 12 people in a class and only four in the teacher training. This is very unique in today’s commercial yoga world. He is a strong teacher but a warm and soft person. Pranavashya has a primary series of 62 postures and is a very intense practice, one that puts most ashtangis to the test. However, the sequencing and the unique breathwork create a calming and levelling of the body and mind that I have not felt with any other yoga practice. Pranavashya can be practiced by anyone. I know of a number of people who had injured themselves while doing other forms of yoga, and after hearing about Vinay had practiced with him while injured and healing. He will always respect your current level of practice and provide modifications and therapy where needed but still leave you feeling challenged. Pranayama (breath control), chanting and kriyas (cleansing techniques) play a big part in Vinay’s teaching methodology. A typical morning practice will include 1.5 hours of asana (yoga postures), followed by approximately 1 – 1.5 hours of chanting and pranayama. Kriyas (cleansing techniques) are performed twice per week. If you have taken on the teacher training – for which you will be granted automatic respect from the yoga community in Mysore! – the days begin very early: 5:30am and finish at noon or even 1pm. Its tough, there is no denying this, but the personal attention and knowledge shared during these times can only be treasured. The afternoons are for back bending and general flexibility. These classes are tailored to the individual and were my favourite part of the day. I found myself in a complete state of surrender to the practice. When practising with Vinay, the ego is left at the door. He is so humble that it tends to attract students of a similar state of mind, or transforms them. I went on a big journey during my time with Vinay; there was excitement, resistance, expectation, acceptance and also some tears of change along the way. I was supported both on and off the mat the entire time. I have since been back to practice with Vinay and have recommended him to a number of my friends, who have all had similar stories of transformation and respect for a great teacher and form of yoga. Things I loved: the chanting, the pranayama, finding myself in places both physically and spiritually that I never imagined possible, the back bending, the little family that the students become, the personal touch to the teacher training with only four students, Vinay’s mum… she is a judge of yoga competitions and in fact critiques your practice exam in the teacher training class and she also holds bhajans (sessions of devotional singing) on Saturdays! Things I didn’t like so much: There is not a lot to say here….there were some early mornings that I was not so happy when my alarm went off…that is until I was on the mat of course! Did you enjoy this article? Look out for an interview with Vinay Kumar due to be published in the near future on the yoga.in blog. In the practice of yoga, drishti is a technique, broadly speaking, of focusing attention, using the eyes to gaze steadily at one point, thus increasing concentration, quietening thoughts and ultimately calming the mind. On an average day we spend so much time looking – there is a constant stimulus of the senses and nerve connections, which can be both a source of energy and fatigue. The nervous system can become tired and saturated, and this is especially true when we are bombarded with information, data, lights, people and screens – essentially anything that comes our way on a daily basis in modern society. The ashtanga system is based on a progressive sequence of postures (asana), synchronised with the breath, bandhas (energy locks) and drishti. The union of these three places of attention is trishthana: performed in conjunction with each other they form a powerful practice that increases energy, purifying the body, mind and nervous system. Asanas are there to purify, strengthen and give flexibility to the body. The breath connects postures to each other through steady, even inhalations and exhalations: this creates heat and further purifies the nervous system. Drishti is the point of gaze in the asana. There are nine drishtis (see below): the nose, the space between the eyebrows, the navel, the thumb, the hands, the feet, up, right and left. This practice calms the mind and generates a sense of focus and stability. Usually, when teachers speak of drishti, they refer to it as a technique to keep the gaze steady and the mind focused. The different gazing points are used as tools to keep one anchored in the present moment, along with the practice of bandhas and ujjayi breath. But by looking deeper, one may uncover other layers of meaning. To maintain focus and concentration both on and off the mat. To guide the directionality of the pose – the gaze often relates to a line of energy in the asana, and makes the practice fluid. Directionality lies both in the alignment of muscular strength, as well as in the intention of the mind. To create awareness – staying still, steady and connected to the moment. To have an internal gaze: it’s not so much about where one looks, but on more subtle levels about looking inwards, so that one’s concentration will not be troubled by outside influences. This is very important in asana as well as pranayama and meditation. To create a meditative state and deepen the connection to different parts of the brain: different drishtis may affect different parts of the brain. Seek to understand the true meaning of drishti. Beyond the simple gaze, there is a way of seeing. It is more about how we are seeing: the visual part of the brain is at the back of the head, so one point is to encourage a feeling that we are actually seeing from that place. Switch on – don’t switch off. Once in the asana, it can be so easy – especially if you’re proficient in that pose – to simply ‘hang out’ in a shape, whilst blankly looking at a steady point. This is switching off. The whole point of an asana practice is to tune in – and practice fine-tuning those elements that need refining. Whether it is a muscular engagement (or dis-engagement), breath awareness, or making space for the body to be at ease, there are always ways to stay present and active in the asana. Failing that, we are just making shapes and looking at our toenails. Relax the eyes. Looking cross-eyed or zombie-eyed is not, as far as I understand, drishti. ‘Quiet eyes’ is a perfect description of a manner to practice drishti. Interestingly however, some have offered other views on the concept of drishti. Manju Jois (Shri K Pattabhi Jois’s son) highlighted that ashtanga yoga was originally taught to young children, and the gazing points were given to stop them from looking around the room. For instance, in adho mukha svanasana (downward dog), they would be instructed to look at their navel as a way to keep them focused. Besides, it is important to note that specific drishtis in asana have altered slightly over time. For instance, in the current system of ashtanga yoga, the gazing point for pachimottanasana (forward bend) is the toes, but Krishnamacharya (in the Yoga Makaranda) said it was the tip of the nose, while the late Shri K Pattabhi Jois is said to have added the following direction: ”Face down, look at nose centre”. So as much as drishtis are there to help us focus and bring us deeper within the practice, one must be able to understand the effects of the eyes on overall posture and alignment. A simple shift of the gaze may be so much more than just mere looking. Urdhva Drishti – looking up. With gratitude to Mark Darby, Hamish Hendry and Norman Blair for their valuable input. Hema, Venkatesha’s wife, conducts the therapeutical classes in the early morning. The same students are attending the class every day of the week at the Atmavikasa Centre Of Yogic Sciences. Most of them have health problems, and Hema knows that she makes a big change in their life. She gives them courage: “Discipline, every day, will lead you there”. She knows how yoga can cure health problems: “This student currently cannot move much, she has arthritis. Come back in 2 months, and you will see her totally changed”. Venkatesha is mostly teaching to the international students, who are ideally here for a period of 4 weeks and more. His task is different: teaching them how to self practice, during their limited time under his direct guidance in Mysore. Later on, Ventakesha performed for us an impressive presentation of asanas, and a Nouli demonstration (an ancient detox technique). His explanations were wonderful! It’s now time to say goodbye to Mysore and head back to Bangalore.